The first time Michael Bradley, Jermaine Jones, and Maurice Edu started together, the Americans couldn’t sniff the net in a 0-0 draw with Colombia. A much better performance from that trio – along with organized defending and efficient finishing from Landon Donovan – led to a 5-1 evisceration of Scotland. Broadly similar in shape, USA's attacking mids (Donovan and Torres) started higher than Scotland's similar pair. 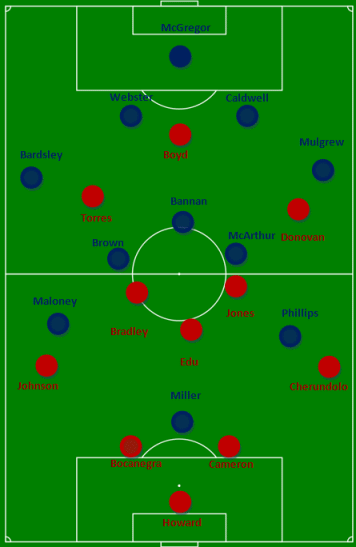 As predicted, Jurgen Klinsmann made use of a 4-3-3, and Scotland’s Craig Levein employed the same formation. However, Scotland’s set up seemed more of a 4-5-1 that became a 4-3-3 in possession, while the Americans were a bit more proactive in the position of their ‘wingers,’ Landon Donovan and José Torres. The gringos also did a better job breaking out of a defensive bunker. One of the major reasons the Americans were able to break so well was the aforementioned central midfield trio. Against Colombia in 2010, Jones, Bradley, and Edu often got in each others’ way, but last night they combined fluidly. Edu sat the deepest; Bradley took the left, Jones the right; and both Jones and Bradley charged forward when the other was in possession. During various sequences throughout the match, some combination of the three would work together to free space for Donovan, Torres, or a charging Fabian Johnson. Their vision – the trio completed 162 of 185 attempted passes – allowed the Americans to easily shift from defense to attack. But what was so impressive about the gringos’ glut of goals was the varied manner in which they occurred. The opener came through high pressure deep in Scotland’s half; the second a Bradley wonder striker; the third intricate passing from Jones, Bradley, and Donovan; the fourth more high pressing; and the last a swift counter. The Scots couldn't penetrate the central area of the American's defense. The only aspect of the match that may have been more impressive than the variety of US goals was the solidarity of the American defense. While they didn’t spend a lot of time pressing up the pitch or intercepting passes in Scotland’s half, the squad’s outstanding organization prevented Scotland from creating but 3 shots (none on goal). Other than the cross that led to the Geoff Cameron own goal – the only blemish on the night – Scotland was unable to complete a single pass into the box. In fact, the Scots were rarely able to even send any passes into USA’s penalty area. Looking at Scotland’s successful passes chalkboard reveals how organized the US defense was. It was as if there was an impenetrable area forming a ‘V’ outside the US box. Much of the praise for the excellent defensive showing should go to Edu, who was positioned at the tip of the ‘V’ when Scotland received possession. Klinsmann must be ecstatic at the way his squad played. They bagged an assortment of goals despite missing two attack-minded starters, Jozy Altidore and Clint Dempsey. While the Scots may have been missing a true creative player, their anemic attack owed much to organized defending from the Americans. Even that most maligned American position, left back, turned into a strength in this game. Fabian Johnson made a number of rampaging runs forward and looked calm in defense. Assuming he stays there full time, he will eventually be targeted by opposition, much like the Netherlands frequently went at Brazil’s Michel Bastos in the 2010 World Cup. The Brazilians should provide a sterner test on Wednesday. When that match rolls around, it will be fascinating to see if the Bradley/Jones/Edu experiment gets another shot. On paper, they would be the perfect foil to a Brazil squad looking to dominate possession. Gringos, what’d you think of the goals? Were you as impressed by the variety as we were? What about the upcoming game against Brazil – will we see the same center midfield? When Klinsmann came aboard my thought was that the US had proved itself to be a competent counterstriking team against big teams but it didn’t have a game that could dictate and dominate a game against the mid level teams. It seems that we have one now. We had the same thoughts when Klinsmann started, and while I think (and hope) the Bradley/Jones/Edu combo isn’t what he’ll use against lesser competition, it’s nice to see that it can work. I think it’s the next evolution of Bob Bradley’s countering strategy. I feel that if Klinsmann ever has Dempsey/Donovan together, we’ll probably see Bradley, Torres, and either Jones/Edu as the midfield trio. Unfortunately I wasn’t able to see the whole game but the highlight reel gave me a good appreciation for the goal variety you described. What I didn’t see/realize until your chalkboard revealed it was that defensive fortress. That’s impressive. Other than the OG, was Cameron’s performance solid? Here is the real question – how does Scotland currently rate against upcoming CONCACAF opponents? While the USA’s performance was impressive, Scotland looked lost… real lost, all on their own. The result is a nice confidence boost for JK and the boys, but it might set us up for a bad reaction against Brazil. Should Dempsey return for Brazil, I suspect we’ll see either Edu or Jones dropped, Torres moved to the central three, and Dempsey taking up a very comfortable role as an inverted left mid. Loved Donovan’s hat trick, but Bradley’s goal was earth shattering.